ne of the fundamental issues in education today is capturing the passion of young people into science and math, the innovation engine of a nation's future, its intellectual capital and ability to innovate. Social media has been at the forefront of engaging people in science through Citizen Science programs like CosmoQuest, Zooniverse and also here at iTelescope.Net where amateur astronomers do hundreds of hours of science each month. Our first grant of the year went to the College Saint Exupery in Perpignan, France. A humble 400 points to enable them to do several exoplanet transits for a local science competition. Immediately I was impressed with the quality of their grant application; they had a keen appetite for discovery of new things and were fascinated with concept of transit timing variations (TTVs), and the prospect that they might be able to detect something really exciting. The 14-year-old students in "Troisième" (which is equivelent to middle school in Australia or junior high in the U.S.) made all the decisions, submitted their grant proposal to their science teacher first, then to their English teacher to make sure it was well written in the "Queen's English" for us convict-descended Australians. They set out their goal to collect two transits and report the data to the TRESCA database run by the Czech Astronomical Society. As most of you know -- not everything goes to plan in astronomy! After several test runs to determine exposure length, and learning about converting universal time zones to local time zones and identifying a suitable target, they discovered some "learnings". What a refreshing attitude to see kids try something, get it wrong, chalk it up as a good lesson in what not to do, work out what they did wrong and quickly adjust. On most occasions when they asked a question, by the time I got back to them they had already worked out the answer themselves, such was their energy and commitment to the task. They had several setbacks, they ran into the bane of every Astronomer's worst nightmare -- WEATHER! The first couple of sessions they booked were "weathered out", then just when they thought they had nailed their first transit, the weather showed up again -- you guessed it -- right at the ingress of the transit, producing this rather interesting light curve, where they lost the middle of the transit. They pressed on undetered! They gave up on the monsoonal flush of weather drowning the Australian east coast and jumped onto iT11 in New Mexico and got a beautiful transit of Qatar-2b but AGAIN missed part of the pre-transit data due to weather, but this time good enough to "tick the box" and submit some meaningful data. Now, do you think that would be enough for teenagers with new toys? Of course not! They were keen to make a discovery and nothing was going to stop them. So armed with over 200 quality images covering over five hours of data they began exploring what else their photometry tools could do. Bingo! They identified a new variable star that was previously unknown. As good little scientists, they know you don't announce discoveries in internet blogs -- you write a discovery paper and have it peer reviewed by a local french astronomer! These kids are just awesome and opitimize the very future of science. The students contacted Raoul Behrend at the Genève Observatory to peer review their work. They had also located a second variable star in their images, and both have been confirmed by Mr. Behrend and have been published in the USNO A2.0 Catalog with the common names of Perp-1 and Perp-2. The students have just returned from their winter break and are now working on a submission to the VSX catalog of the AAVSO. Astronomy is a great way to get kids involved in analytical and critical thinking without them even knowing they are learning something until it’s too late! Astronomy is really the science of everything. The entire universe is the laboratory, and we use mathematics, physics, chemistry, biology and all the technology and engineering skills we can muster to learn who we are, where we came from and what our place is in the grand scheme of things. If you want to give meaning to a young person’s life, introduce them to astronomy and help them find answers to the biggest questions we can ask. What is surprising to many people is how important variable stars are in the landscape of astrophysics. When we study variable stars we are really studying the secret lives of stars. How they are born, live out their lives for millions or billions of years, and die, sometimes as white dwarfs or in violent eruptions that seed the universe with the raw materials to make the next generation of stars, and us. I have learned just as much from the College Saint Exupery Students and their energetic teacher (Julien), as they have from their project. It's been great to be part of their journey, which I am sure we will hear more about very soon. So to the budding scientists at College Saint Exupery, you are an inspiration to all. Good luck with your discovery paper and your entry in the science competition. iTelescope.net wishes to thank the parents of College Saint Exupery who graciously gave permission to publish the class photo. iTelescope.net considers each grant application on its merits, and gives preference to Education, Science Research and Citizen Science collaborations such as OSIRIS-Rex. 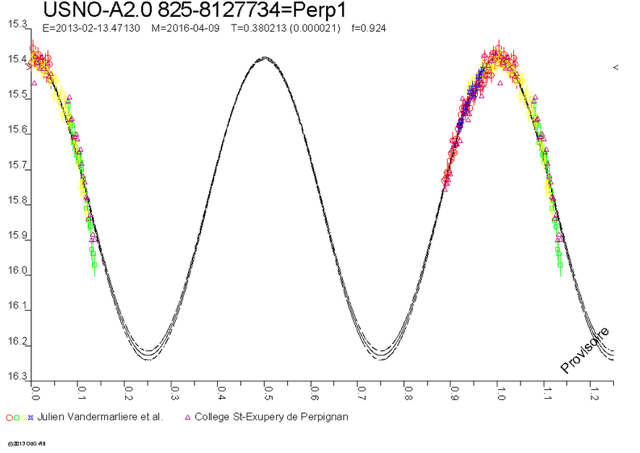 Perp-1 has been accepted by the VSX team at the AAVSO - Congratulations!! !